Homoeopathy is a system of alternative medicine. This principle is also found in the writings of Hippocrates (400BC) and even earlier in those of the ancient Indian poet Kalidas (approx. 10th Century BC). 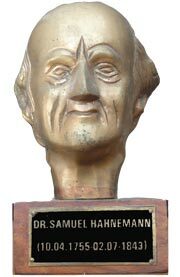 It was a German physician Dr. Samuel Hahnemann who founded a system of therapeutics in 1790. This therapeutics system was based upon his doctrine like cures like. Hahnemann became interested in the curative powers of the medicines. He read in one of the text books of his time that cinchona bark (from which quinine is extracted) cured malaria type fever. He thought that the best way to determine the action of cinchona was to see is how it affect human body. Thus he took some of the substance himself. And much to his surprise he developed fever, chills and other symptoms resembling those of malaria. This result made him see that the reason why cinchona is ver much effective in cases of malarial type fever, perhaps because it is capable of producing a very similar condition to malaria. He repeated this experiment many times and performed several other medicinal substances on himself. He also experimented on volunteers from his family, friends and students, and each time obtained the same result. Dr. Naveen Chandra Pandey is the founder & senior practitioner at Sahas Homeopathic. He is renowned personality in this region. His practice exceeds over 20 years. At Sahas Homeopathic we provide fully personalised modern Homeopathic treatment on the principles of classical Homoeopathy. Sahas Homeopathy Clinic and Medical Store is one of the most popular names in Haldwani, Rudrapur, Nainital and nearby places. Here everyday comes a lot of patients to get cured. Sahas Homeo is Known for its excellence in the field of Homeopathy.